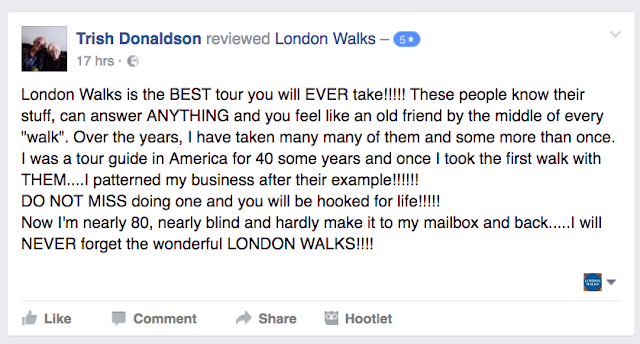 London Walks is the BEST tour you will EVER take!!!!! These people know their stuff, can answer ANYTHING and you feel like an old friend by the middle of every "walk". Over the years, I have taken many many of them and some more than once. I was a tour guide in America for 40 some years and once I took the first walk with THEM....I patterned my business after their example!!!!!! DO NOT MISS doing one and you will be hooked for life!!!!! Now I'm nearly 80, nearly blind and hardly make it to my mailbox and back.....I will NEVER forget the wonderful LONDON WALKS!!!! Daily Constitutional editor Adam replies… Wow! What a review! Thanks Trish for taking the time to get in touch. That is one special review and I will be sharing it with my London Walks colleagues today.